I, David Brodie, as a downtown urban designer, feel I must take a stand on the following issue. The success of our downtown is largely dependent on its character and vitality. If there is no character and vitality then there is no significant draw for people of all ages to come downtown. The character and vitality of a downtown depends on its proportional distribution of uses. This particularly includes maintaining representation of “mom and pop” stores which provide locally-sourced (and therefore sustainable) goods and services. A worrisome situation in our downtown is the ever-increasing number of corporate stores as well as eating and drinking establishments. This is causing an imbalance in the ideal mix of land uses. It would seem that the different groups and individuals who exercise considerable influence over the survival of our downtown do not understand this basic tenet. Included among these groups are the City Council, Downtown Business Association and the Chamber of Commerce. Carlyn is also an advocate of providing more housing downtown and will work toward insuring that downtown becomes a suitable environment for downtown residents. I and Save Our Downtown envision that she will lead the Council and our City in growing a dynamic, vital and long lasting downtown. David Brodie was a Professor in the Architecture Department at UC Berkeley from 1963 to 1970. 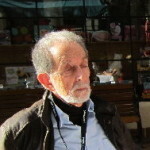 David was hired to teach Architecture and City and Regional Planning at Cal Poly in 1970 and retired in 2004. He has been a guest lecturer at universities around the world and has, since his retirement, been actively involved in civic affairs. I have visited San Luis Obispo twice a year for the last 30 years because it has very a special and unique downtown that you simply don’t find anywhere else. In 30 years, I have seen it grow and prosper and change in ways mostly for the better. all the shops are being replaced by bars and restaurants that serve alcohol. I like beer and wine just as much as the next guy, but from a visitor’s perspective the downtown is losing much of its special character. Maybe its easier to see from the outside and maybe those who live there don’t realize what a wonderful place they live in. There has been a lot of anonymous name calling in this thread. If you disagree, then you should state your reasons why in a clear and constructive way. A meaningful dialogue shouldn’t include comments about race, accent and profession. Sin sells. Selling = profit. No one wants to NOT profit from their labors, in one way or another. Just a sad commentary on our society, really. There are still some gems out there, but like the real gems, they are pretty hard to find sometimes. Downtown SLO has been rapidly changing for the 40 years I have been going there. I don’t see your point. Change, per se, ain’t a bad thing. I agree we don’t have any need for name calling in this thread. Comments about profession are meaningful when the writer offers his opinion as a professional opinion. Comments about race are seldom germane. Comments about accent might be important when one is affecting an accent to put on airs, or add to one’s “professional” or professorial aura. I have no idea whether that is Brodie’s situation or not. What a clown. “Housing downtown” is advocated by all. Paul Brown does not oppose housing downtown. But it is market driven and frequently a tough nut to crack. I’d feel better talking about the realities of projects with Paul Brown than poindexter here, or his minions Hill and Christiansen. Notice how the very rudest, most divisive and insulting comments on this thread come from people supporting Brown. Mr. Brodie’s comments are reasonable and worthy of respect, even if you don’t agree with his endorsement. This whole idea that anyone who is well-educated doesn’t know what they are talking about in the “real world” is a bigoted commentary and does not represent reality. It sounds like something Rush Limbaugh and others who are insecure about their education say. Paul Brown is totally uninformed and ineffective–Brodie is righrt as usual–he is the one with the educational background and the world wide experience—these ignorant commentators can”t match his PHD in urban planning. If left up to the likes of the comentator and the Browns of the world we would have to rename this place Boozerville. Please verify his “PhD in urban planning”–year and university. I could only find a master’s degree in 1964 from UC Berkeley. The master’s degree is the usual terminal degree in Architecture; the PhD is the usual terminal degree in City and Regional Planning. ..and obtaining either of those degrees usually signifies one does not work in the professional world; rather, is a government leech of one type or another. Wisdom-we DO have boozerville already if you look at the state of Brodie’s properties in the downtown area. The other nice buildings in the area attempt to overcome the negative image of Brodie’s blighted properties. Too bad that fancy educational background can’t overcome the contradiction of how he runs his own part of downtown. Provincial, arrogant and rude. Check in again after you get your Ph.D.
“Provincial”? Excuse me, I’m off to play the grand piano. Brodie is a useless sack ‘o crap who has never held a legitimate job. He will single-handedly ensure Brown’s victory. He sure got me off the fence and saved my ballot from the fireplace. obispan, you owe Mr. Brodie an apology. In fact, you owe all decent people who read this forum an apology. You very likely owe that grand piano an apology as well. What possible GOOD do you imagine your extremely rude and bigoted comments do for our community? Your continual sick comments demean yourself and this community. I hope one day, for your sake, you will recognize the error of your ways, before it is too late. May God help you. You wanna see “market driven”? Go to Atascadero. They don’t believe in city planning and you see what it’s got them….a mess. Good City planning is why SLO is one of the best small cities in the nation. Don’t believe me? Ask Forbes. You left winger’s are so interesting.”WiserGuy” wants an apology for crude remarks by “Obispan” and then “GalaxyTraveler” turns around and berates Atascadero livng style. These are two different types of communities and should not be compared. This is definitely a problem with the Democratic Party. You might be surprised to know that the original SLO town plat was laid out by the Spanish missionaries following “Laws of the Indies” planning principles (google this to find out more). It specified a centrally located plaza, civic structures fronting the plaza, a 12 block square gridiron of streets radiating out from the central plaza or presidio and rotated approximately 45 degrees to favor south exposure. Agricultural plats aligned on the north-south grid surrounded this street grid. This “town plan” gives SLO it’s unique charm because, unlike most unplanned communities our downtown was not confined to one main street accompanied by typical strip commercial development (a.k.a., Atascadero or Santa Maria). So as you can see, the “charm” of our downtown has little to do with ad hoc growth but rather with good, sensible planning principles. What’s scary is that some people actually listen to guys like this. Mr Brodie has been taken care of by the state his entire adult life. He lives in the academic bubble where no one challenges his ideas and his ideas never has to be tested in the real world. Of course he would support the only democrat supported candidate. His reasons though are faulty. He truly believes that the government can regulate a better society. That should frighten any thinking person. We need a city council that listens to it’s citizens, not one that tells it’s citizens what to do! I’ve read your comments before and I am typically in some part in opposition (because you are in some part wrong). I cannot vote for Christianson, and I advise you and Paul very humbly accept my support. What is this? “Back to the Future? Get in Dr. Brodie’s time machine and you’ll be downtown strolling past Green Bros. Men’s and Boy’s, Norton’s Pharmacy, Hill’s Stationary, Farley’s Jr. Restaurant, Ed’s Sporting Goods and Carpenter’s Rexall? Ain’t gonna happen. This nostalgic cover is a cover, for something else, Big Sis Carlyn Christiansen who knows better what good for you and the City than you do. A prospect so frightening that Spatafore and Rice tripped over themselves getting out of the way to prevent disaster. At least Brown represents, not directs, a point of view present in the community and at least one symbolic vote against City officials being paid more than our state leaders (the City attorney makes more than the State attorney general and the City manager more than the governor). Is this your way of letting us know the count has already been done before any votes have come in?